Over the next several weeks, The Great Workplace.com is going to introduce North East Ohio to a new set of standards for organizations striving to become noted as a Great Place To Work, or as we call it, The Great Workplace 2.0: Each article will give you an in-depth view of the results of 3 years of research into what The Great Workplace MANAGERS and OWNERS believe and know make their organization special. We are NOT talking about the Fortune 100 companies or the High-Tech companies who have become synonymous with “Corporate Benefit Give-A-Ways”, we are showing you ideas that YOU can duplicate in your own company: principles and actions that can be applied in start-ups, old-line companies, and organizations who simply know that “something needs to change”. Let’s cut to the chase: the discoverable attributes of The Great Workplace of today and tomorrow have been right under our noses for decades. But, for reasons based in envy, we have knelt before the thrones of “the big boys” and tried to replicate their glitter and gold. Smaller and start-up organizations have failed in that pursuit, and in many cases, simply gave up trying. The result: many small to medium- sized organizations have been only partially constituted and have fallen short of their true potential. Shame on us, when the actual path to becoming a remarkable organization is solidly within our reach. And that reach is a span of principles and principle-based executions that do not necessarily require the king’s ransom to implement. 1. Corporate Statement of Purpose. 8. Provides Tools To Achieve Purpose. 9. Buys Local, Promotes Region. 10. Tangible Leadership that Promotes the Purpose. Feel Free to circulate this content, as long as you acknowledge it’s origin. 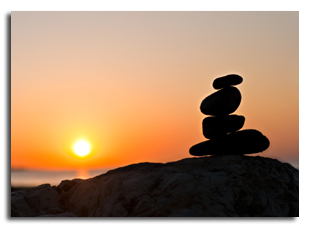 The Photograph is of an Inukshuk. Typically used by the Inuit people as a point of reference, directions marker or pointing to food stores.